First HER Club in Morocco! 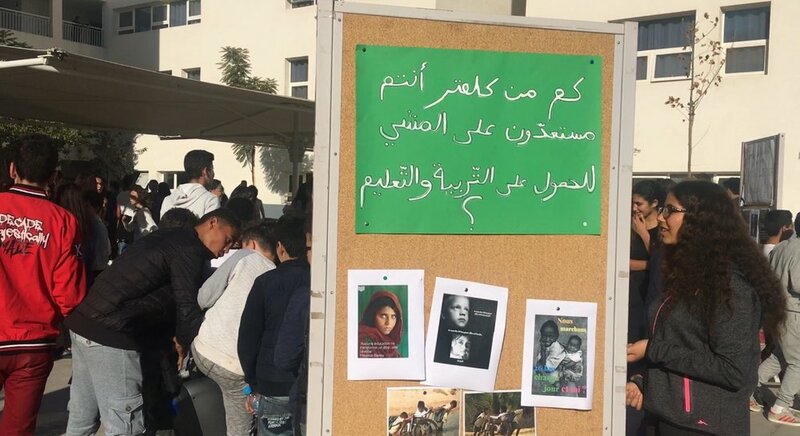 This year, outstanding student Yasmine Sami started a HER Students' Club in her high school in Casablanca, Morocco– Lycée Français International Louis Massignon. On Universal Children's Day (November 20, 2017), Yasmine and 15 student volunteers created a display in their high school with two bicycles and banners saying, "How many kilometers would you be willing to travel to receive an education?" Yasmine explained, "With this activity, we want to evoke the daily lives of thousands of children from rural areas who are forced to walk miles and miles to get to their school." Yasmine also posted quotes about education throughout her school and hosted a book drive. Thank you to all who planned and participated in this thought-provoking event! HER Bookfair at Barnes & Noble Bookstore!